This test determines the total number of aerobic bacteria in the product. It is 48 to 72 hour test. This test determines the total number of yeast and fungi in the product. It is carried out till five days. 16S rRNA and 28S rRNA sequencing. Fatty acid methyl ester analysis (MIS) by gas chromatography (GC-FAME) has been used for over 50 years to identify microbes in environmental and clinical settings. · Includes all the reagents required to perform DNA to Result analysis. No additional reagents needed. 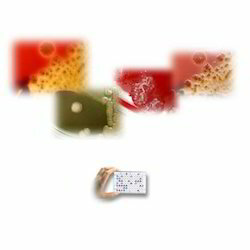 Being the foremost company, we are offering an exclusive array of S. Aureus Microbial Detection Kit. Our offered array is famous for its attractive functions. Time-proven and most accurate rapid detection system based on colorimetric principle.It ensures the availability of results for routine organisms in as short a time span of only 8 hours and for Tuberculosis as early as 10 days. VITEK® MS is an automated mass spectrometry microbial identification system that uses Matrix Assisted Laser Desorption Ionization Time-of-Flight (MALDI-TOF) technology. VITEK® MS contains a comprehensive IVD-CE marked database for bacteria and fungi, including mycobacteria, Nocardia and moulds. If you need to know simply, inexpensively, and right now - then you need to know MIDI.